I have some mixed feelings about this book. This book wasn’t what I expected it to be. It claimed to be different than The Fault in Our Stars, and it did deliver in that area. 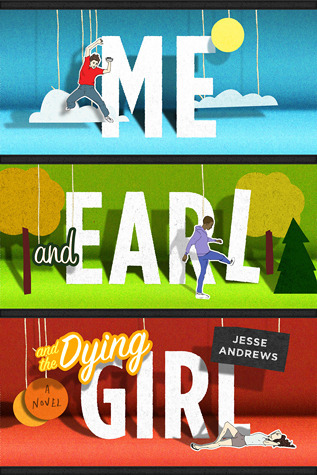 There is little to no romance involved, and what I thought was interesting is that even though Rachel (the dying girl) is the whole reason this story is even happening, I didn’t feel like the story really included her all that much. The formats. If you’ve been around here for awhile, you know that I love books with different and fun formats. This book had some great ones. I really loved the one with the newspaper headlines summing days up. It was a brilliant way to skip time without making you feel like you just jumped a week ahead without any warning. There were times when he summed up dialog with bullet points, and there are scenes written in script format. Greg. I liked Greg, most of the time. The rest of it I spent annoyed with him. He seemed kind of whiny. At first I liked the paragraphs when he was like this book is so terrible, and I don’t understand why you would keep reading it and on and on. When I first started reading this book I loved them, I thought they were really relateable and funny, but after a while they just got old. The films. I loved hearing about all of their different films and film ideas. They were funny and entertaining to read. The humor. Some of the humor was so vulgar I literally cringed. What Earl thinks is funny and what I think is funny are two very different things. Yep, I think the f word is used a fair amount, and there is a lot of profanity. No, but it is graphically talked about. I didn’t, but I think there is a high chance that you will. 3 out of 5 hedgehogs, it wasn’t terrible but it wasn’t one that I would recommend to my friends. I would have given it 2.5 but the different formats bumped it up to 3. Jesse Andrews here is his website. I feel like I’m the only one who didn’t find this book to be hilarious. Do you think that vulgar humor is funny? Have you read this book? Will you read this book?